I guess it’s not technically winter yet but it doesn’t quite feel like fall anymore either. We have yet to have any real snow here in the city and I might be one of the very few people who are actually unhappy about it. Things just look a little grey and I think a good dusting of snow is just what we need. I bought a few twinkle lights and have slowly been gathering pine branches off the ground from the christmas trees on sale below the apartment. Every time I walk by I stop just for the smell. I was thinking of making a wreath or something to hang on the door, but for now they are just popped up in a vase and my money’s betting that that is exactly where they will stay until the new year. My charlie brown decorating skills have become somewhat of a tradition I guess, so why change. My girlfriend came over with her wee one the other night. We sat in front of my little fire place and drank tea and chatted babies and marriage and life. We laughed, I made dinner and we were probably both in bed by 9pm. Last weekend I visited my sister, and while we managed to squeeze in a lot of things in just a few short days, we mostly spent our time talking about food. She took me to a few of her favorite places in the city, we toured the christmas market, bought the best-ever kimchi and I snuck in a cookie for the road home at my must-stop whenever I visit. After a few long days at work this weekend I swung by Shelley’s place before heading home. I had something for her and she had picked up a few goodies for me too. We chatted at her kitchen table, mostly about food and travel plans and cookie swap ideas. The novelty of just being able to stop by or go visit family has definitely not worn off on me yet. Having been so far away for so long, these simple little visits mean the world to me. I don’t really mind what we do, I just want to sit in good company and pretend like time has stood still. Because the real things haven’t changed, it is still best to laugh together, to learn from and to be inspired by each other. So I strung up a few twinkle lights in case any one wants to stop by for a cup of tea. I’m just happy to put the kettle on. 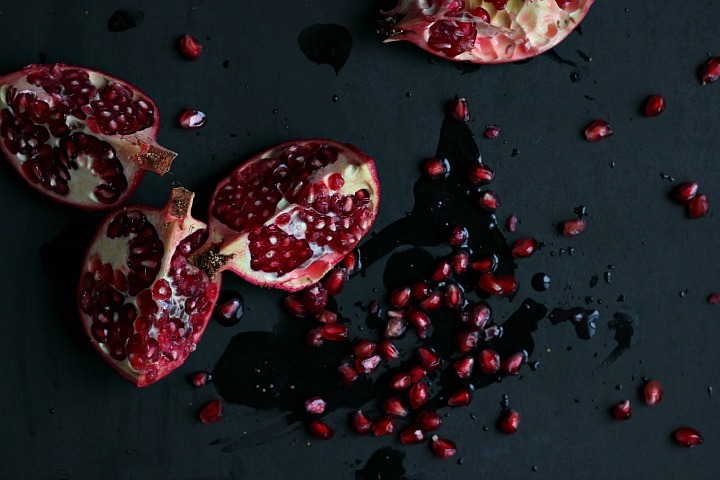 I’ve been de-seeding pomegranate like it’s my job lately. As soon as it starts to feel grey and winter-like I always gravitate towards the more exotic fruits at the grocery store. 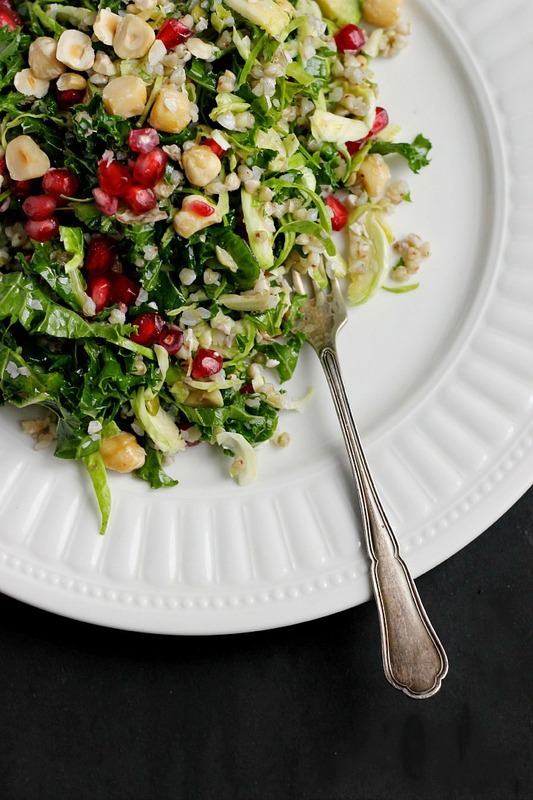 Brussel sprouts may not be everyone favorite, but this dish is a great way to sneak them into your weekly meals. 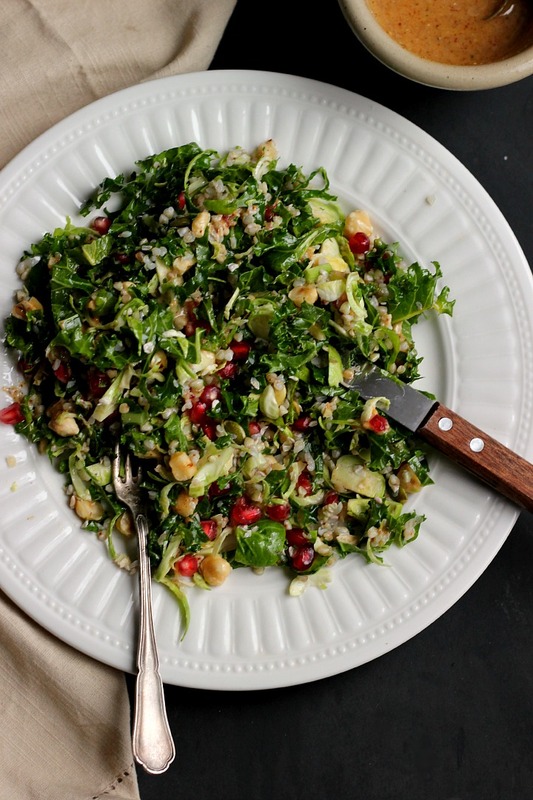 A good, hearty salad recipe is a great thing to have on hand during the holidays, something to bring to a potluck and share with friends. This one can definitely be made ahead of time, keep the dressing on the side before serving. Dressed leftovers will keep in the fridge for at least a day or two before wilting. I love the simplicity of this salad, the colors and the textures. I added buckwheat here because I like to bring salads to work and need a little something to keep me going, but quinoa or lentils will work as well. 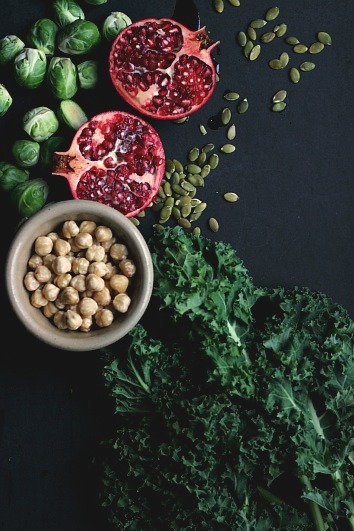 Vegan + Gluten Free. Serves 2-3 as a main. More as a side. Double ingredients to feed a large crowd. Rinse buckwheat groats under cold water for 30 seconds. 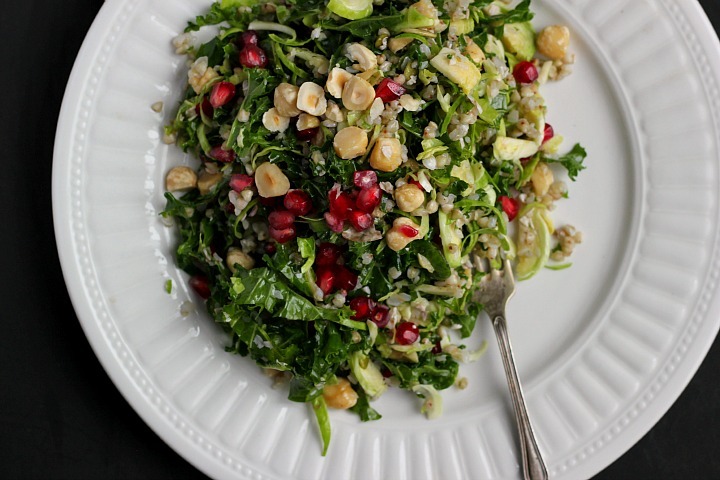 Bring a large pot of water (at least 3 cups) to a bowl, add a pinch of salt and then add the buckwheat. Let boil uncovered for 7 minutes, then remove from heat, cover and let sit for 2 minutes, no more. Strain and rinse the buckwheat then set aside. 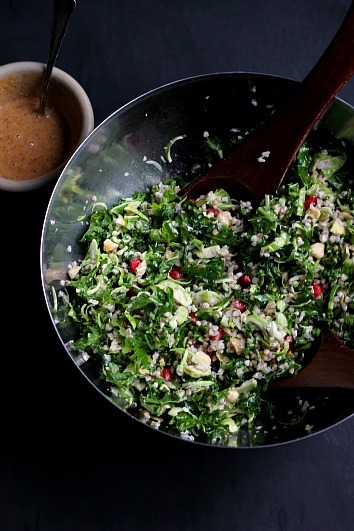 Place thinly sliced kale and brussel sprouts in a large salad bowl. Sprinkle with touch of salt and a drizzle of extra virgin olive oil. Using your hands, massage the oil and salt into the greens until well absorbed and the greens turn a vibrant shade of green. 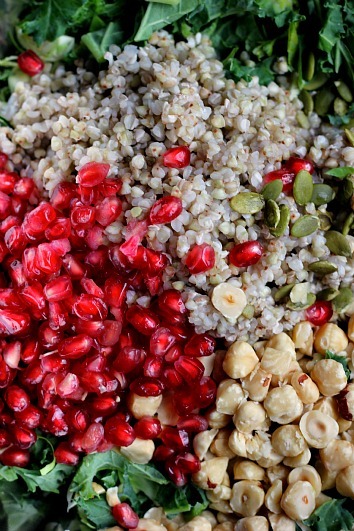 Add buckwheat, pumpkin seeds, hazelnuts and pomegranate seeds to the bowl. 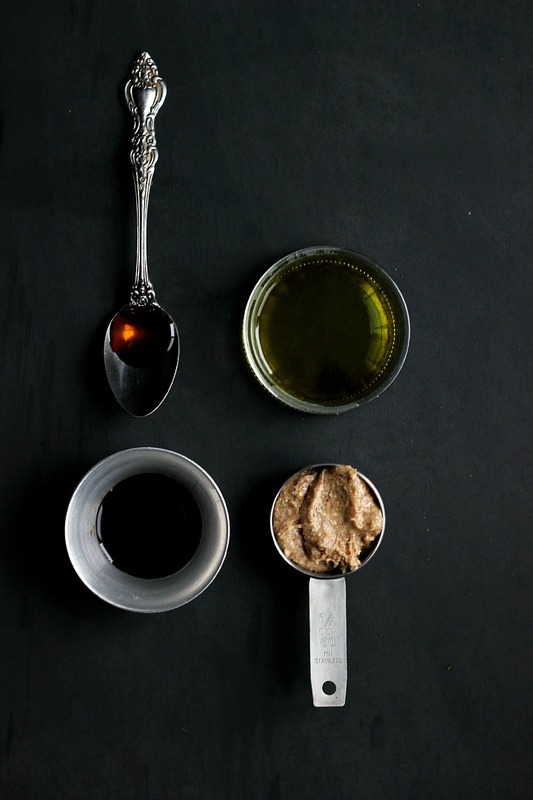 To make the dressing, mix together almond butter, tamari, maple syrup, vinegar and oil in a small bowl or blender. Taste and adjust seasoning if needed. Add an extra splash of tamari for added salt, a touch more vinegar to cut richness or a drop or two of maple syrup to round out the sweetness. Add a splash of water to thin, if needed, to get desired consistency. I added about 2 tablespoons. Pour half the dressing over the salad and toss to combine. 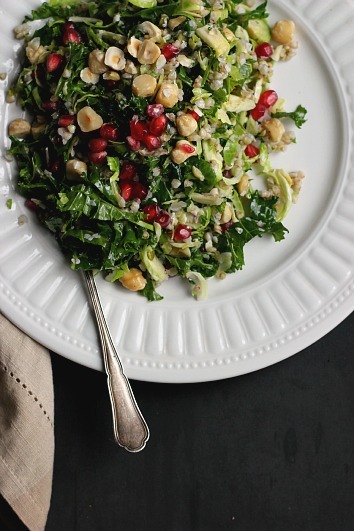 Serve with extra dressing on the side and top plates of with a few extra pomegranate seeds for color. Your weekend sounds just perfect, I’m all about the 9pm bedtimes! 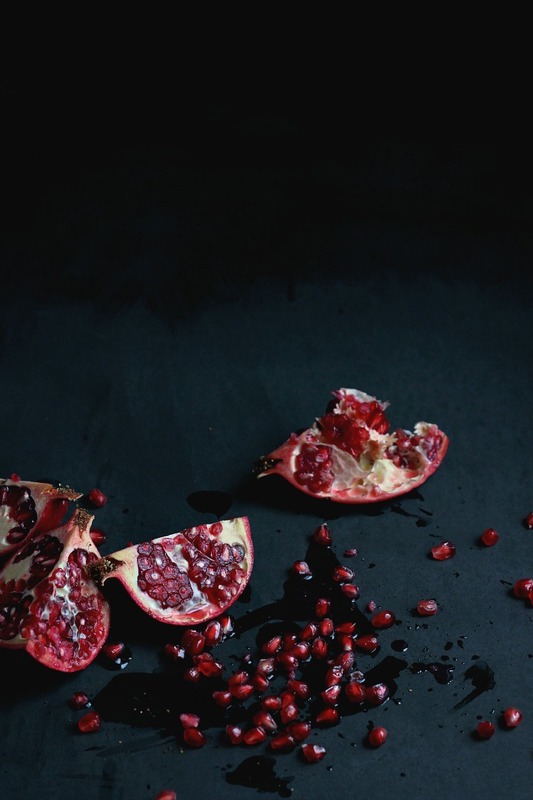 Just love your blogs Jodi! This one hits home for me.